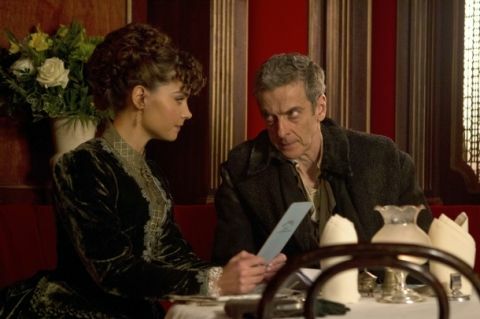 The Twelfth Doctor’s steampunky debut proper is extremely creepy at times, and plays with some surprisingly gruesome notions – particularly during one encounter between Clara and the villain of the piece. Though the story's been rated PG for cinemas, it wouldn't have been that surprising if it was a 12. We also wouldn’t be too surprised if a few parents complain about imitable behaviour! Expect to be powerfully reminded of an episode from season two of the new series – though the script does acknowledge this. As it does the story’s debt to, er, a famous hairdresser. The meaning of that title? Think “Blink”. The Doctor gets to show off his mastery of another unusual language. There are some good Scottish gags about Capaldi’s accent. Sontarans make for very dangerous paperboys. The issue of a certain Roman is (obliquely) addressed. Jenny strikes a pose. There’s nothing to it. The Doctor gets a different face again. A human and a non-human lock lips. An unanswered question from season seven rears its head again. It’s clearly connected to this year’s story arc. There's also a flashback to a moment from season seven that seemed incredibly insignificant at the time. There's a very good chance you will, er, get something in your eye. “Deep Breath” airs on BBC One on Saturday 23 August.